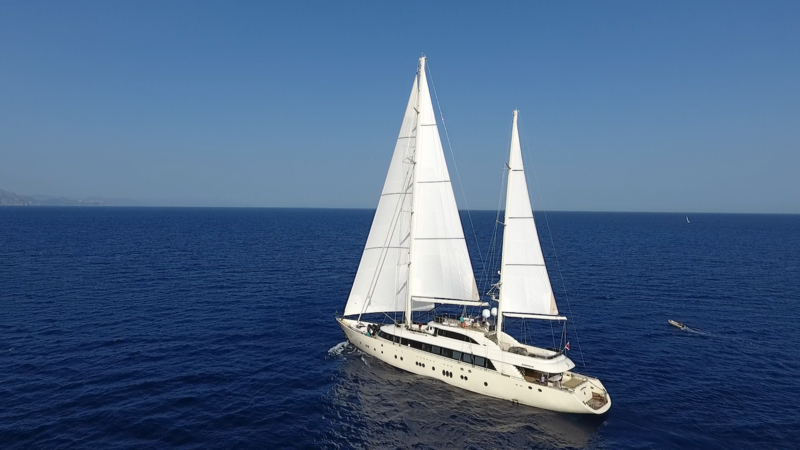 ARESTEAS is a 50.75m (166' 6") luxury motor-sailer yacht with tasteful and elegant interiors and exceptional deck areas, offering accommodation for up to twelve guests in six vast staterooms, while serviced by a crew of eleven ensuring everyone has a relaxing time aboard. 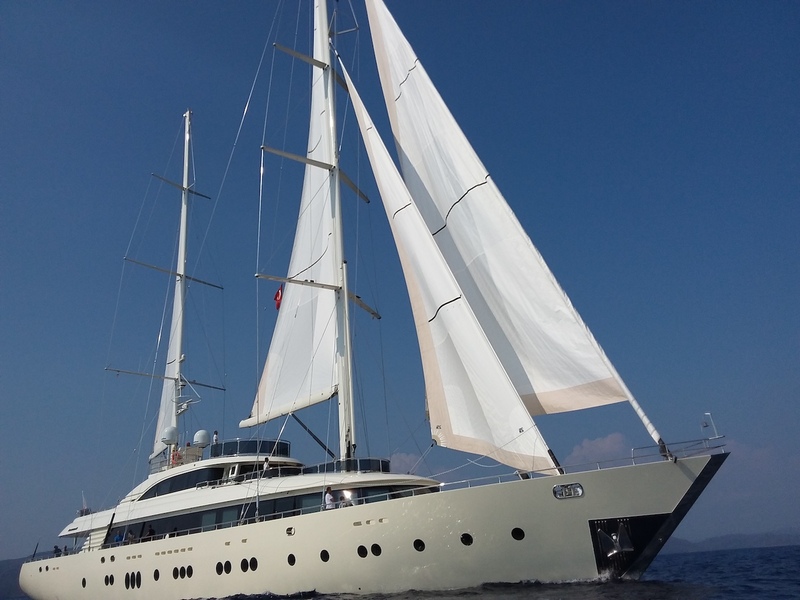 She was launched in 2017 by Aresteas Yachting with naval architecture by Fuat Turan and represents one of the finest examples of her kind, bringing together timeless elegance of sailing with the generous volumes of a motor yacht. 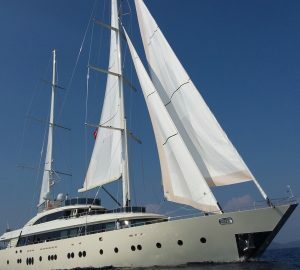 She is a perfect choice for family yacht charters or luxury getaways with friends. 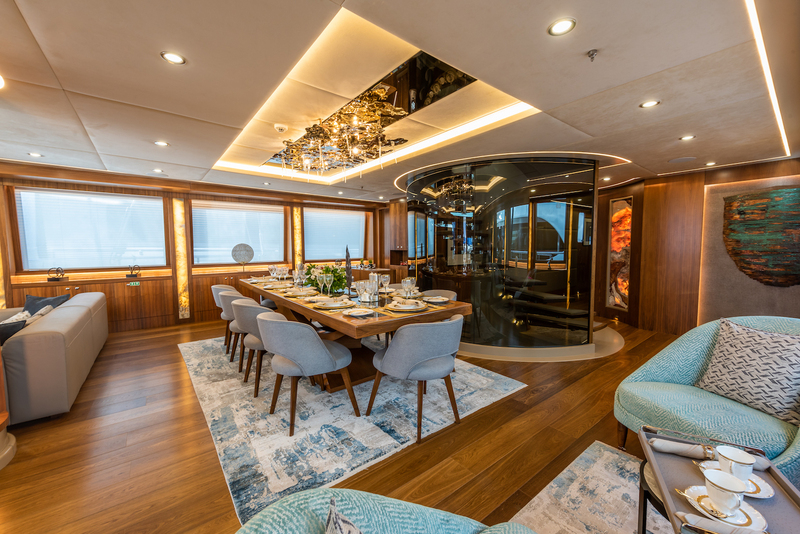 ARESTEAS offers exceptional comfort, spacious socialising areas both indoors and throughout her exterior deck areas, characterised by a stylish decor as well as the latest in entertainment and amenities. The lower deck aft has a broad swim platform for sunbathing, easy access to the water and water toys, and acts as an extension to the beach club, where there is a stairway to the main deck cockpit. 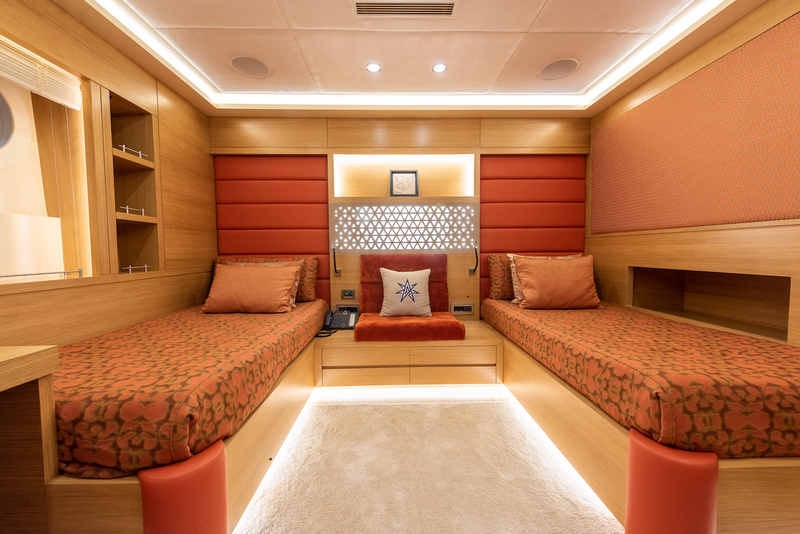 There is a port lounge consisting of a sofa, two armchairs and a coffee table, and along the stern, there is a raised dining table for casual alfresco meals. 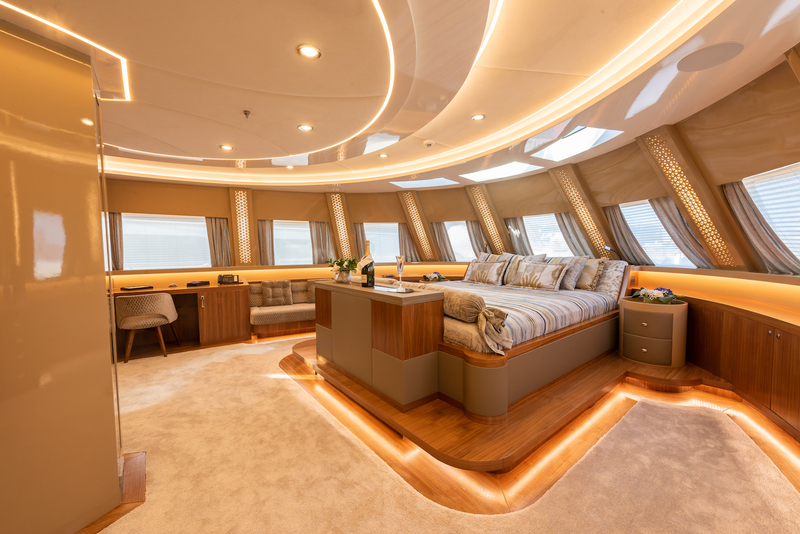 Up on the flybridge aft, a sizeable Jacuzzi is integrated along the stern between two sunbeds. The alfresco dining area is placed to starboard and provides an L-shaped sofa and free-standing chairs in the shade, for comfortable group meals benefiting from fresh air and panoramic views. The foredeck hosts the larger guest tenders, leaving the lower deck stern free for guest facilities. 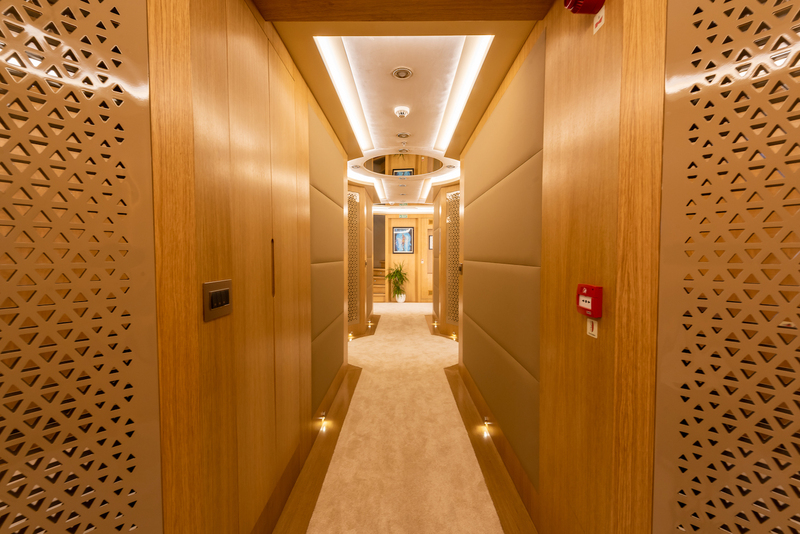 The lower deck layout places the crew accommodation, crew mess and laundry facilities forward with the guest accommodation amidships, along with the gym and spa wellness centre containing a massage room and an infrared Himalayan salt sauna. 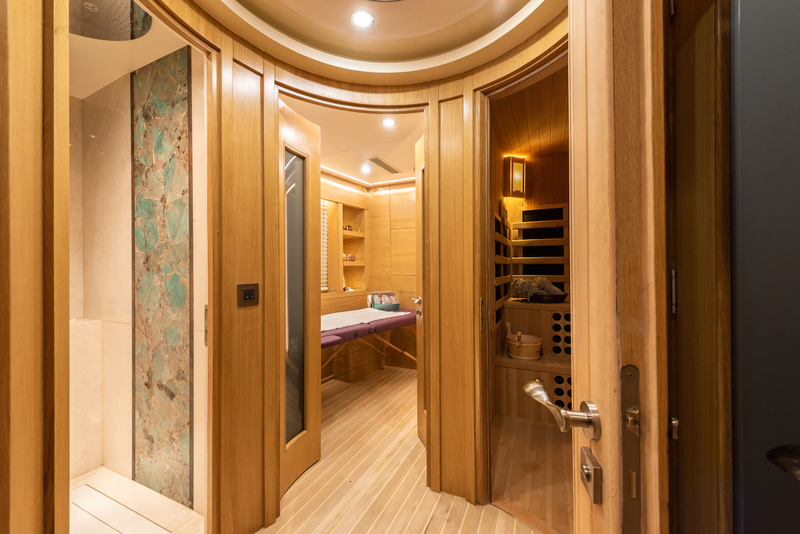 Behind the VIP staterooms, there is the engine room and then the tender and water toys storage, which creates a reverse C-shape around the beach club with a wet bar. 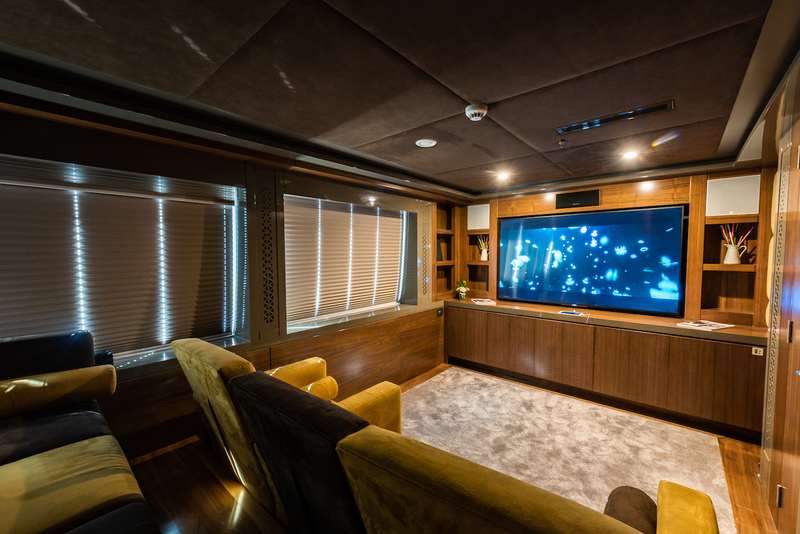 On the main deck, the Master stateroom is placed forward with the galley to port and a beautiful home cinema to starboard of the Owner's passageway. A circular staircase connects the floors and enhances the sense of space within the open-plan main salon. With elegant and stylish Italian interiors designed by Aldo Viani the main saloon includes a massive formal dining table that seats 10 guests, which is placed horizontally across the room and receives magnificent views through the large windows running down either side of the room. Two armchairs and a drinks table to starboard create a casual place for guests to rest after a meal, and the lounge is furnished with an L-shaped sofa, coffee table and armchairs in addition to a large and well-stocked wet bar. The saloon’s earthy colour tones and natural materials such as leather, treated wood and marble, provide guests with a homely yet luxurious feeling. The upper deck offers a second lounge behind the helm station and staircase, where guests can unwind and socialise. 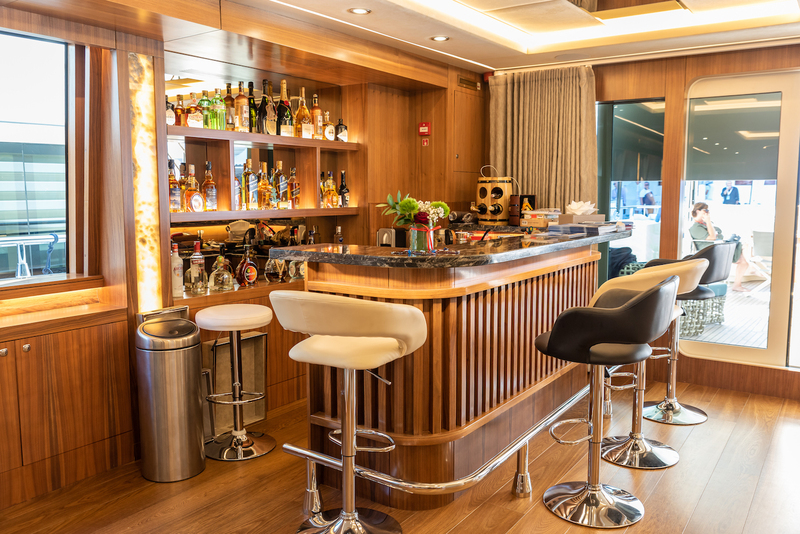 A small lounge is placed to the port close to the glass sliding door to the upper deck aft, and to starboard, a second wet bar is ideally positioned to serve guests inside and out. 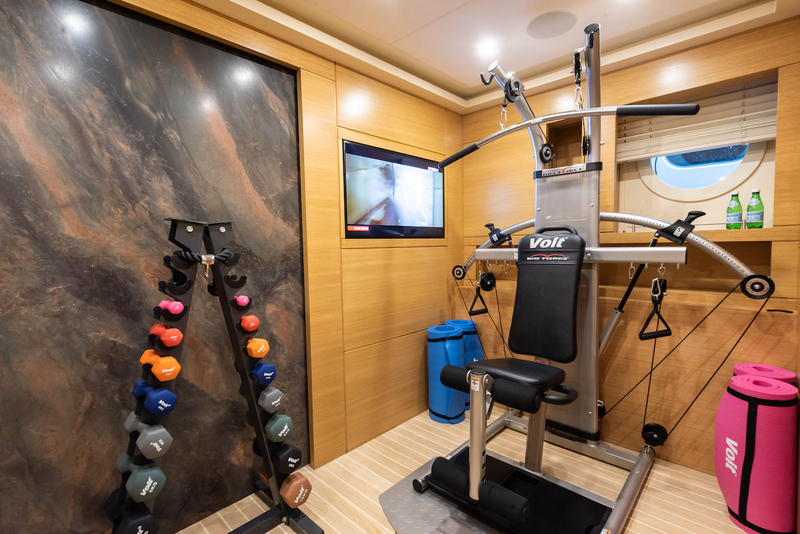 Thanks to her vast living areas and extra features including a fitness room, wellness area, glass-bottom Jacuzzi and home cinema, charter guests will find the same comfort and luxury aboard Aresteas as they would in any luxurious villa ashore. Twin MTU 10V2000M72 engines each producing 1,205 HP create a top speed of 15 knots, a cruising speed of 12 knots and a range of 3,50 nautical miles. The accommodation sleeps a maximum of 12 guests across 6 en-suite cabins: 1 Master suite, 2 VIP staterooms, 1 double cabin and 2 twin cabins. The voluminous Master suite is placed on the main deck forward and is fitted with a king-sized bed with a widescreen TV opposite, a sofa, desk and walk-in wardrobe to port and a gorgeous marble bathroom to starboard, within which there is an enclosed shower and toilet, two sinks and a spa tub. 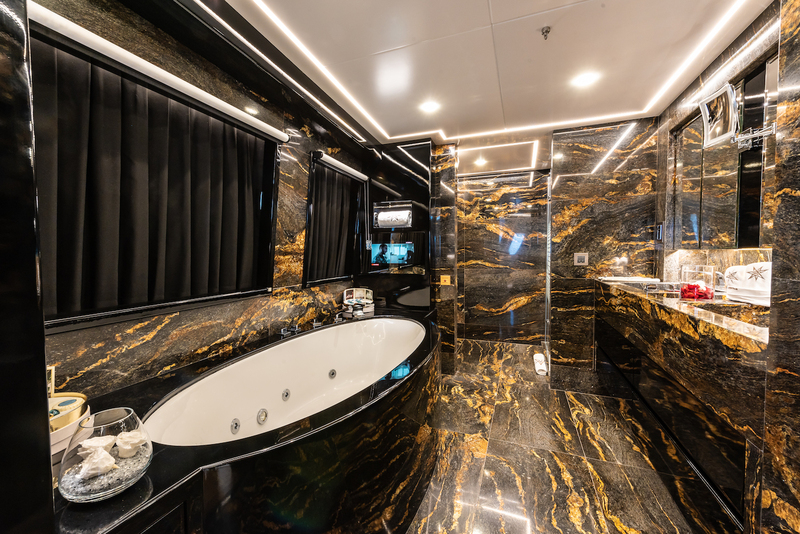 ~ The VIP staterooms are placed aft of amidships on the lower deck and each boasts a queen bed with a desk and a private lounge consisting of a sofa and daybed integrated along a wall and free-standing armchairs and a coffee table. 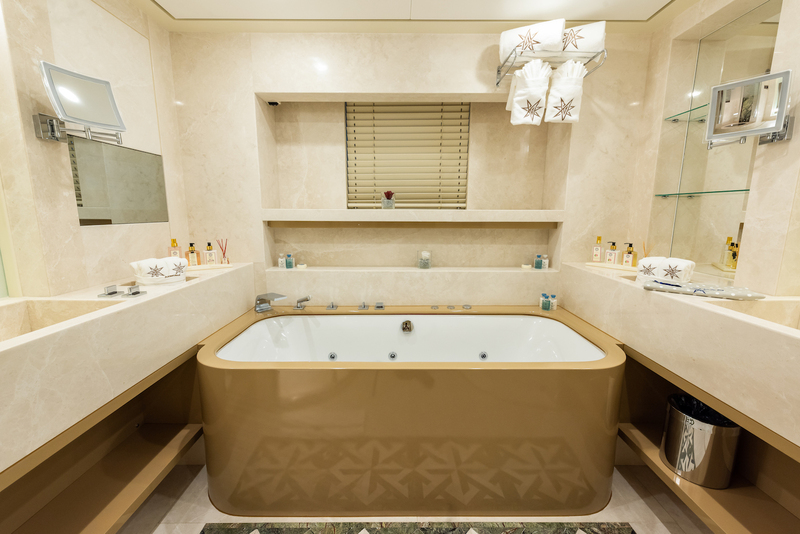 The en-suite bathrooms to the aft each have two sinks, a spa tub and an enclosed toilet and shower. ~ The double cabin is placed between the port VIP stateroom and the forward twin cabins. Both have a desk, sofa and en-suite bathroom with a toilet, sink and shower. ~ The crew of 11 are accommodated in the lower deck bow.